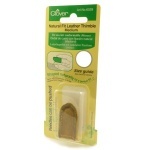 Natural fit thick leather, sewn 3 dimensionally from 2 layers of leather to allow the needle to be pushed from any angle. Medium size, inner diameter approx 16mm. Dimpled and ridged metal top, with the body made from flexible rubber for maximum comfort and air flow. Large size - 17mm. 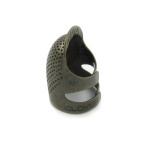 Dimpled and ridged thimble with the body made from flexible rubber for maximum comfort and air flow. 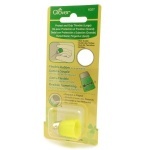 Medium size - 15.5mm. Dimpled and ridged metal top, with the body made from flexible rubber for maximum comfort and air flow. 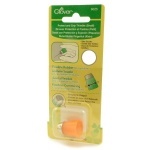 Small size - 14.5mm. With stretchy elastic for a comfortable fit, the leather is great to protect fingers if you find a traditional style too bulky. 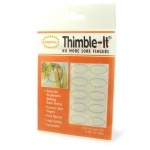 Quilting thimbles are an essential tool for for hand quilting, to protect your fingers while enabling you to push the needle through the fabric and wadding easily - we have a large range of thimbles for quilting and sewing, so if you're wondering where to buy thimbles you should be able to find the perfect quilting thimble for your needs here! 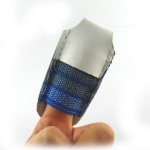 Our range includes Thimble-it finger pads for the minimum barrier just to protect the bottom finger from needle pricks, leather thimbles for a natural feel, stainless steel thimbles with a ridge around the top for maximum needle control, silicone thimbles and more. 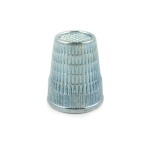 All our thimbles come from top manufacturers such as Clover, Hemline and Prym, so quality is guaranteed. 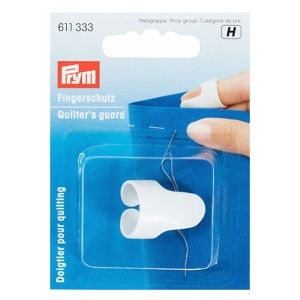 No matter what technique you use, we have hand quilting thimbles in stock to make it easier, all with superfast UK delivery!